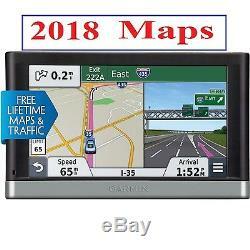 Garmin Nuvi 2557LMT with 5 big Screen auto GPS. Lifetime real time traffic receiver & free update(build in Traffic receiver on Charger, don't need cellphone). Installed 2018 Australia and New Zealand, 2017 South America. Installed 2017 South America Maps. Colombia, Costa Rica, Paraguay, Peru, Republic of Panama, Suriname, Uruguay, Venezuela. 100% function, GPS did has some scratched on frame and screen but not major. Buddle with GPS Maps installed, Car mounts, Car charger build in Traffic adapter, USB cable and Manual with original box. Nüvi 2557LMT has a bright 5.0 display with dual-orientation capabilities, for use horizontally or vertically. Detailed Maps with Free Updates. Nüvi 2557LMT arrives loaded with detailed maps of North America. With free lifetime¹ map updates, your routes are sure to reflect the most up-to-date maps, POIs (points of interest) and navigation information. With so much data, nüvi 2557LMT makes it easy to find addresses and millions of POIs such as businesses, stores, restaurants and other destinations. Nüvi 2557LMT arrives preloaded with POIs, so theres no need for you to enter that address information. Just select one or many and navigate there, quickly and easily. You also have the ability to add custom POIs to your nüvi 2557LMT. Nüvi 2557LMT features Garmin Traffic. To help you spend more time on the move. With Garmin Traffic, your driving map remains onscreen at all times. Traffic alerts appear to the side of your map and messages are spoken, too. Garmin Traffic can give details about the situation, such as how many minutes of delay to expect and if there are any possible detours. It can even confirm whether or not you are on the fastest route. Lifetime traffic² entitles your nüvi 2557LMT to receive free traffic information for its entire useful life. Garmin Real Directions with Garmin Real Voice. Nüvi 2557LMT redefines spoken turn-by-turn directions with Garmin Real Directions, easy-to-understand driving directions that guide like a friend, using recognizable landmarks, buildings and traffic lights. No more stress from trying to read street names. Garmin Real Voice is refined speech technology that sounds more like a natural, friendly voice. Garmin Real Directions and Garmin Real Voice are features that are only available in our line of GPS navigators. Comprehensive Driving Guidance You See and Hear. Active Lane Guidance with voice prompts prepares you to drive through an exit or interchange with confidence. As you approach, an animated model uses brightly colored arrows to indicate the proper lane needed for your route; a friendly voice offers additional help. Birds Eye junction view offers a detailed view of interchanges, looking down as if from overhead. PhotoReal junction view realistically displays junctions and interchanges along your route, including the surrounding landscape. Brightly colored arrows indicate the proper lane to drive. Nüvi 2557LMT also depicts real road signs as they appear along your route. More Information at a Glance. 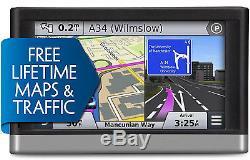 Nüvi 2557LMT keeps your driving map onscreen at all times and additional information appears alongside. For details, simply touch the screen. As you drive your route, Up Ahead constantly informs you of nearby services, including restaurants, fuel stations, hospitals and stores. Nüvi 2557LMT displays speed limit, current speed and accurate time of arrival. With a quick glance, you can read the name of your current street. Nüvi 2557LMT also shows school zone warnings. To keep your nüvi up-to-date. Garmin Express makes it easy to update maps and software, transfer favorites to and from devices, and install free custom vehicles and voices. Albania, Andorra, Austria, Azores Islands, Baleric Islands, Belarus, BelgiumBosnia & Herzegovina, Bulgaria, Canary Islands, Channel Islands, Croatia, Czech Republic, Denmark, Estonia, Finland, France, French Guiana, Germany, Gibraltar, Great Britain, Greece, Guadeloupe, Hungary, Iceland, Ireland, Isle of Man, Italy, Latvia, Liechtenstein, Lithuania, Luxembourg, Madeira, Malta. Martinique, Moldova, Montenegro, Netherlands, Northern Ireland, Norway, Poland, Portugal, Republic of Macedonia (FYROM). Réunion, Romania, Saint Barthélemy, Scotland, Serbia & Kosovo, Slovakia, Slovenia, Spain, Sweden, Switzerland, Turkey, Ukraine, Wales. The item "Garmin nüvi 2557LMT with 2018 World maps Lifetime maps & traffic Bundle" is in sale since Monday, April 30, 2018. This item is in the category "Consumer Electronics\Vehicle Electronics & GPS\GPS Units". The seller is "estore19992016" and is located in Babylon, New York. This item can be shipped to United States, Canada, United Kingdom, China, Germany, Japan, France, Australia, Russian federation, Denmark, Romania, Slovakia, Bulgaria, Czech republic, Finland, Hungary, Latvia, Lithuania, Malta, Estonia, Greece, Portugal, Cyprus, Slovenia, Sweden, South Korea, Indonesia, Taiwan, Belgium, Hong Kong, Ireland, Netherlands, Poland, Spain, Italy, Austria, Israel, New Zealand, Philippines, Singapore, Switzerland, Norway, Qatar, Kuwait, Bahrain, Croatia, Malaysia, Antigua and barbuda, Aruba, Belize, Dominica, Grenada, Saint kitts and nevis, Saint lucia, Montserrat, Turks and caicos islands, Barbados, Bangladesh, Bermuda, Brunei darussalam, Bolivia, Ecuador, Egypt, French guiana, Guernsey, Gibraltar, Guadeloupe, Iceland, Jersey, Jordan, Cambodia, Cayman islands, Liechtenstein, Sri lanka, Luxembourg, Monaco, Macao, Martinique, Maldives, Nicaragua, Oman, Pakistan, Paraguay, Reunion.